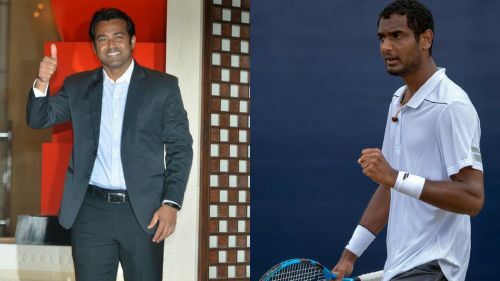 New Delhi, Aug 6 (PTI) Leander Paes might team up with Ramkumar Ramanathan instead of Sumit Nagal in this month's Asian Games after captain Zeeshan Ali said he will consider the ATP World Tour finalist's request to pair up with the senior pro. In the originally planned combinations, Rohan Bopanna was teamed up Divij Sharan and Paes was paired with young Sumit Nagal for the men's doubles event. After his sensational run at the ATP Newport event, where he ended a runner-up to Steve Johnson, Ramkumar had said he would love to win a medal with Paes at the Asian Games, beginning August 18 in Jakarta and Palembang. "I will have a chat with the players when we reach there and then take a decision. There are a lot of different aspects to it. I don't want to take any decision now but there is a possibility, considering, that Ram and Leander have played together in the past and know each other's game well," Zeeshan told PTI. Ramkumar and Paes have paired only once on the Tour. At the Pune Challenger in 2016, they reached the quarterfinals but Paes has been mentoring Ramkumar since then. After making his maiden ATP World Tour final, Ramkumar had credited Paes, the winner of 18 Grand Slam titles, and Sanjay Singh for providing crucial inputs during the tournament. Ramkumar will also compete in the men's singles event in Palembang with Prajnesh Gunneswaran and Nagal was picked up as a backup. While a lot of doubles players, including Vishnu Vardhan, N Sriram Balaji, and Jeevan Nedunchezhiyan had questioned the selection of Nagal in the doubles team, Zeeshan had defended the choice by saying that the young player from Haryana could play both singles and doubles, if required. The captain has time until sign-in to announce the final combinations. The singles will begin on August 19 and the doubles the next day. Of all the players named in the Indian squad, only Paes and Divij Sharan have won medals at the quadrennial event. While Paes is the winner of eight medals, including five gold while Divij won a bronze in the previous edition with Yuki Bhambri, who has opted out of the upcoming edition.